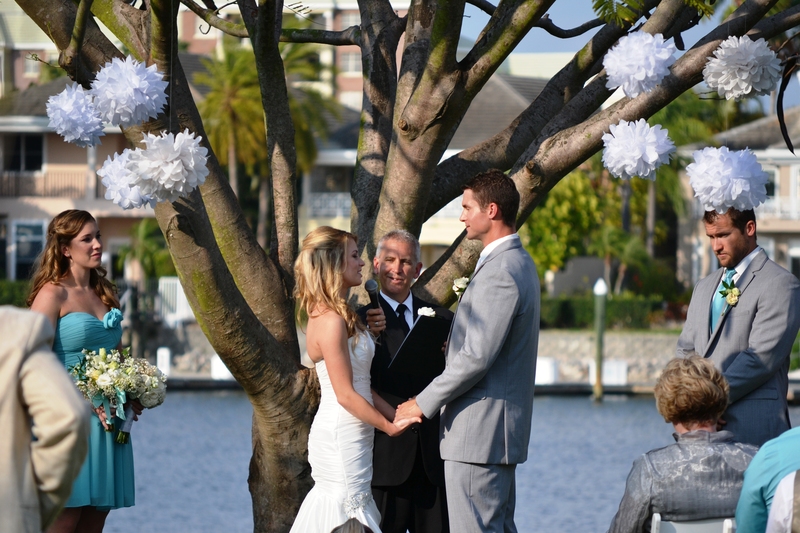 It was a beautiful day this past Saturday at the David Islands Garden Club for Christina and Rob’s wedding ceremony. Christina looked absolutely gorgeous as she was escorted down the aisle by her father to join Rob under the trees overlooking the water. There, in front of their family and friends, the couple shared their vows, exchanged rings, and were pronounced husband and wife by Rev. Rick Lackore of Sensational Ceremonies, LLC. The ceremony music was provided by professional pianist, Yesid; Florals and décor by Andrea Layne Floral Design; DJ by Jacob Smeaton with Celebrations 24;Wedding Planners Melissa and Jenna; and Wedding Photographers Francine and Lionel. This photograph was provided by Tammy Lackore. Congratulations to the new Mr. and Mrs. Rob Barthelemy!